Surviving Ireland: Living in Dublin Ireland - Such a Choice! Living in Dublin Ireland - Such a Choice! Mike, and to answer your question, fortunately you and your family have any number of options. In the 1980s, when I first came to these green shores, such options frankly didn't exist. The area surrounding Dublin was, yes, composed of suburbs, but access to Dublin could be time consuming due to the relatively poor infrastructure (roads and the like), and the choice of housing for either purchase or rent/lease was limited. Depending on how long you think you're going to stay here, schools and/or nurseries are also going to be a consideration. But the situation has drastically changed since those early days of my immigration: now we have such a choice! And due to the current economy, housing prices (both rental and purchase) have descended dramatically. The wealth generated during the Celtic Tiger Years, as well as grants and loans from the EU, positively affected both Ireland's infrastructure and its choice of housing stock. It was simple economics: as the country's economy grew, the wealth of its people increased. As disposable income, savings, and anticipated future wealth grew, demand for housing - and the types of houses for sale - also grew. Additionally, the government as well as private companies and private/public companies, began to develop the road network. When I came here, 4 lane motorways were unheard of. Today, Ireland is criss-crossed by an ever-growing network of Motorways. The M50 (a 4 lane motorway circling Dublin), the M1 (providing an artery to the North), the M3 (currently under construction, but an artery from Dublin, north to my town of Navan, and eventually to Kells and beyond), the M7 (toward Limerick), and the M8 to Cork represent billion euro investments that have improved the lives of Irish motorists to no end. In the process, these arteries have opened up many Dublin 'suburbs'. It's simple location theory: make it easier and quicker to get to a place, and watch the houses (and house prices) sprout like mushrooms. And along with the houses will come the rest of the infrastructure: improved telephone services, broadband, more schools, shopping centres and malls, restaurants - and traffic! We have much more traffic today (due to increases in car ownership) than we ever had. While the current economy will invariably stifle new infrastructure development for a number of years, it surely is one hell of a lot better than it used to be only 20 years ago. Do you want to live a life by the sea? Then to the South look at Bray or Greystones. Both are wonderful, smaller towns, only a few miles from Dublin (a friend of mine lives in Bray, and the M50 now makes it easier to get there). Both have fabulous seashores. To the North (just north of Swords on the map), try Skerries. That's a marvellous village: a small fishing town, boats nestle quietly at dock as you stroll along a seaside walk. The village itself is picturesque: a single main street, a few shops, pubs, and coffee bars, and wonderfully small estates of housing surrounding the entire village. If you go further north, (north of Balbriggan - Baile Brigin), try Bettystown. Also along the coast, it's a wonderful small town. Looking for something in the hills? Then again go south to County Wicklow. While much more expensive than other places, it offers exceptional housing, close communities, and wonderful walks through the hills. Some of the places mentioned above are a bit 'remote' meaning that a shopping centre might be perhaps a half hour to an hour away. But all of these places offer the necessities: shops, schools, petrol stations, churches, pubs. And a welcoming people. Okay, so suppose you would rather live in a larger town not too far away from Dublin, with closer access not only to the city but to local shopping centres and similar. Again, the choice is rather amazing, and depends on what you want. Personally, and for my money, I'd look at County Cavan, and Virginia in particular. Again, it's a bit isolated - about 20 miles north of Navan (An Mhi on the map), and perhaps 35 miles from Blanchardstown Shopping Centre (Google Blanchardstown Shopping Centre - this has all the major shops), but this smaller town offers exceptional value for money, a lake, and much more. Bigger again? Then why not consider Navan? 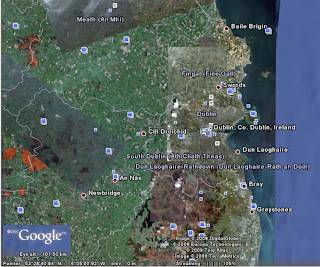 Good schools, easy access to Dublin, a shopping centre, the Boyne River, and a zillion pubs (or so it seems). Or perhaps Trim, about 8 miles down the road. This is a delightful town: the River Boyne meanders by Trim Castle (action scenes from Braveheart were filmed there a number of years ago); it has wonderful walks, good shopping, and a great choice of housing. Besides, a good friend of mine comes from there, so I'm biased. Go directly west from Dublin and you'll have all sorts of choices: Naas, Kill, Newbridge...the list goes on and on. Be a bit careful if you choose to go out this way. Some of the communities have been over-built, meaning empty housing, apartments and office blocks. Tallaght now has this problem, and it will take years to get back to something approaching supply/demand equilibrium. I hope the above helps. The question you've asked makes me realise just how far this country has come in only a few short years. And it also makes me realise this: yes, right now the economy of this country is on its knees. But so it was in 1994. Then, this amazing miracle happened. I'm convinced that given the resilience of the Irish people, and with a little realistic political leadership, this miracle will recur. 60,000 thousand ( or 60,000 towelsan as my irish neighbors would say it ) americans in Ireland..
since first visiting here in 2002 i have met two so far. that leaves me 59 towelsan 900 hundred and 98 to go....question ....where are they? Greetings, Ole. And the research for my book confirms that you are absolutely right. I'd rung the US Embassy and they told me that 60,000 Americans now call Ireland home. Where are they? Almost everywhere. I've run into Americans in Dublin, Meath, Donegal, Belfast... They come here for a variety of reasons: because their job has transferred them, in a pursuit of a new life. One guy I met was hiding here due to a divorce, with a child in hand. Needless to say, I didn't ask any questions. Glad that you've found a home at last. Thanks again for the great advice on places to live that are convenient to Dublin. We have two more questions for you as we approach our move to Ireland date of 30 December 2009. First of all, we have researched your suggestions and found nice properties in all of them. We noticed that you did not mention Portlaois or Portarlington. Are these areas suffering from the overbuilt and empty housing problem you mentioned for Naas, Kill, Newbridge and Tallaght? We wonder because it seems we could get a lot more for our money in either Portlaois or Portarlington. Also, are these areas good for raising a family with small children? Secondly, how difficult is it to rent a home without first having employment? Everyone says it is easier to get a job in Ireland if you are already living there, and it is almost impossible to get one beforehand. We are currently working on a nest egg that would carry us until I find work. Included in the nest egg would be funds to cover a reasonable rent for roughly 6 months. Do you know if it is possible to negotiate with landlords to pay several months' rent up front in lieu of being able to show employment? I don't want to run into the situation where I need to live in Ireland to find a job, but I need a job to be able to live in Ireland. Once again, we appreciate your advice as we embark on this great adventure! And for anyone reading this and planning to do what we are doing...please buy Tom's book. It will help you immensely! one question for you, how can be difficult it that if any one want a apartment for rent without having first employment? i hope you will give question's answer as soon as possible. how difficult is it to rent a home without first having employment? Everyone says it is easier to get a job in Ireland if you are already living there, and it is almost impossible to get one beforehand. How Do I Get Irish Citizenship?